Thanks to my PR Contacts at Nerf, they’ve sent exclusive information in the form of an image, production description, release date/release frame, and price. You can check those out below, as well as my thoughts on the blaster’s design, price, and game functions. Video version of the news discussion if your more of a visual/audio person. 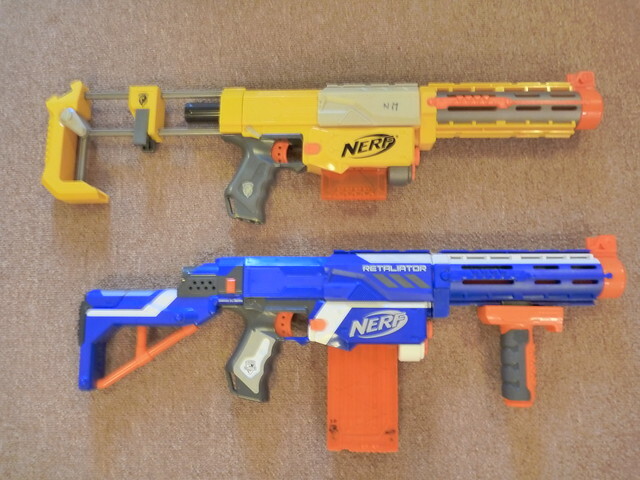 On top is the N-Strike Recon CS-6, on the bottom is the N-Strike Elite Retaliator. Sorry for the first two blurry photos. I was in a hurry to leave my main blaster storage and I only discovered a better setting for the last photo. Swapping the parts, it looks quite funny doesn’t it? Man, the blue and yellow mix looks quite ugly. Just, ugly. 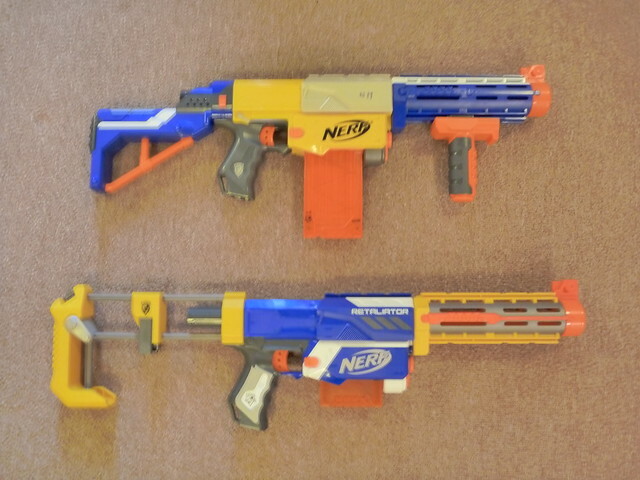 The N-Strike Rampage is at the top, while N-Strike Raider CS-35 is on the bottom. Theres a couple of subtle cosmetic changes on the Rampage. First, the Rampage as a whole blaster looks smaller then the Raider, or is it just me? The handle of the and stock addition area are a darker gray then the Raider. The area below the magwell on the Rampage has gray, while the same area on the Raider does not. The Rampage handle has a darker gray area, while the Raider’s is lighter. Finally, the Rampage’s colors are accented with white and gray. The video is a little late I know, but our internet has been slow lately and I forgot to upload it. Anyways heres a video of me unboxing the Gear Up blasters Nerf sent me. Not a bad color! Reminds me of Tiger Style. Thanks again Urban Taggers. Video by Mediocre Movies. Old video from back on 09, but I discovered it today. It’s got an old style of editing and some decent humor. If you don’t like this video they have many more on their channel for your viewing pleasure. Sale at Target for $27 plus $5 coupon makes this $22 Raider a good deal! 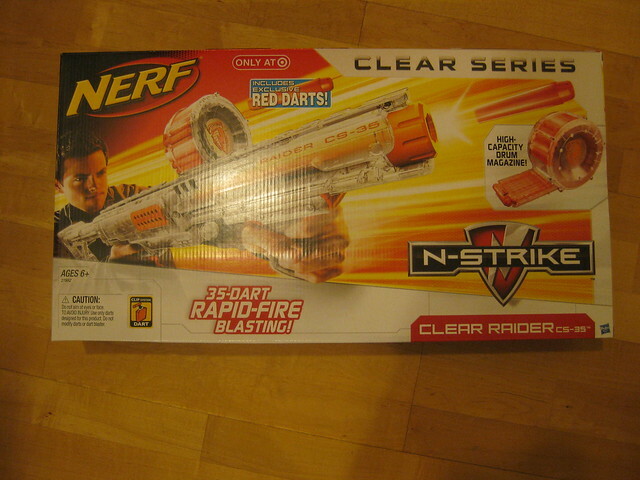 It’s been a little over a year since Nerf released their famous, promoted 9/9/2009 gun. Can you believe it’s been a year already? Does the Raider stand the test of time? 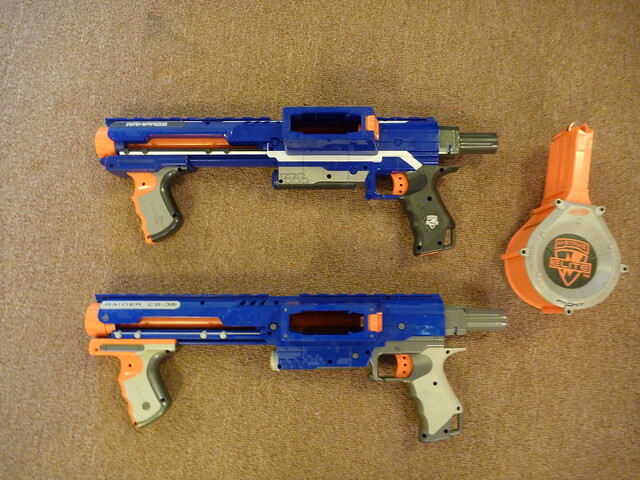 How does it compare to newer blasters? Is this blaster worth the normal $30 USA tag? Check the review and find out! Again girls in Nerf is a plus for me. I think they got those 90’s costumes on point haha. Again Happy Thanksgiving!